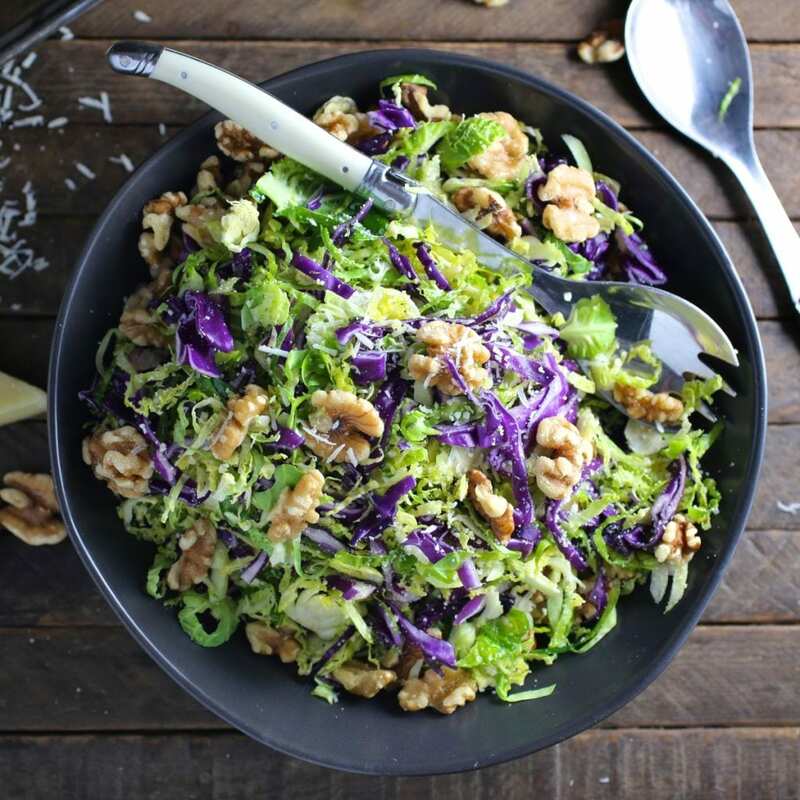 A beautiful, healthy salad that combines thinly shredded brussels sprouts and red cabbage with toasted walnuts and Pecorino cheese. Simple but so delicious. In the midst of all the joyous holiday feasting, it’s easy to forget the pleasures of a simple, really good salad. Don’t get me wrong, one glance at our Instagram feed tells you that we’re chock full of holiday spirit (in the form of toffee, cookies and homemade eggnog) but sometimes it all becomes just a bit too much, you know? 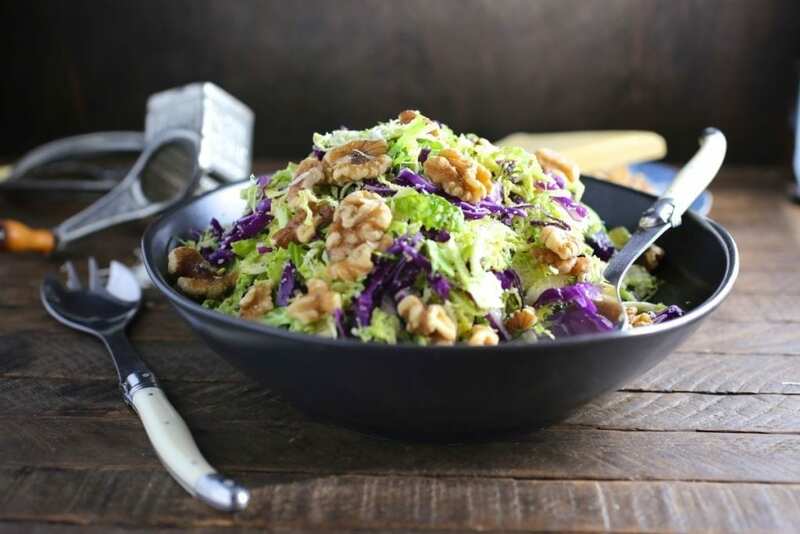 I was going to make this salad for Thanksgiving but feared there would be a riot if there was no Shredded Brussels Sprouts with Bacon and Pecans on the buffet, so I played it safe. Brussels Sprouts are one of my favorite vegetables when they’re cooked right (meaning not boiled into a mushy, sulfurous mess). I like them roasted in a very hot oven until they get crispy as french fries, or crisped up in a pan with bacon and pecans. And I love them like this; shaved fine, tossed with a simple lemony dressing and speckled with pecorino and walnuts. When mixed together, the salad becomes almost Caesar-like, with the sharp dressing and salty cheese. You could use parmesan if that’s what you have but I love Pecorino Romano for its bold, pungent flavor, and it’s also a whole lot cheaper. Our version was adapted from an Epicurious recipe (by Gourmet Magazine, Jonathan Waxman). 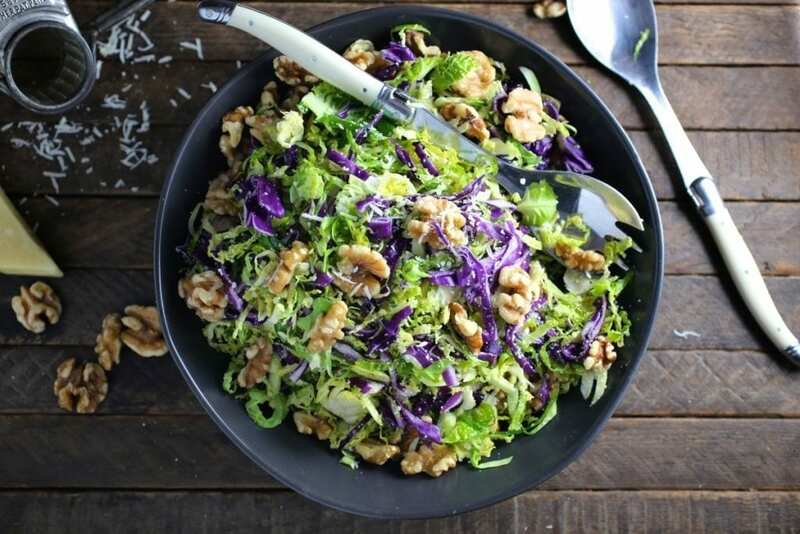 Using a mandoline, knife or the shredding disk of a food processor, cut the sprouts into very thin slices. In a small bowl, add the olive oil, garlic, mustard and lemon juice. Mix until well combined. Season lightly with salt and generously with pepper. 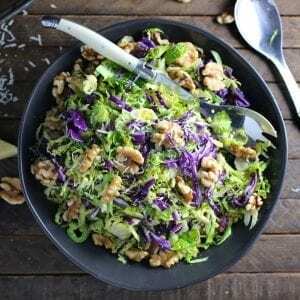 Add the shredded sprouts and cabbage to a large bowl and toss with the cheese. Toss with half the dressing and taste, add more as necessary. Taste for seasoning. Sprinkle on the walnuts and serve immediately or within a few hours of tossing. What a beautiful salad! I’m going to make this recipe this weekend.